The Studios of Cocoa Beach, 165 Minuteman Causeway in downtown Cocoa Beach has challenged nine guest artists to create works featuring roads, alleys, vintage roadside attractions and unusual perspectives on travel. 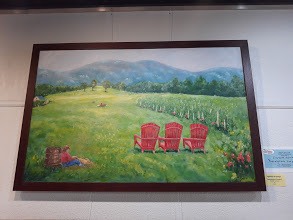 The Award of Excellance was won by Elizbeth Scholder for her oil painting “Rappahannock Vineyard.” Lyssa Bowe won the 1st Merit Award and James E. Kalupa won the 2nd Merit Award. Awards were sponsored by Heidi’s Jazz Club in Cocoa Beach.